Well this is an amazing yet sad sight to witness. Fishermen in Pakistan apparently found this 40 foot long whale shark dead offshore, and hauled it to a dock in Karachi on Tuesday. As you can see in the video, cranes were used to haul the massive and magnificent beast ashore, in front of a curious and excited crowd. 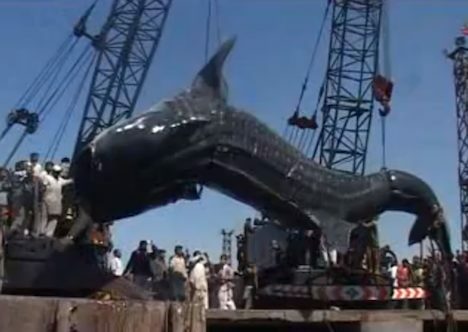 The whale shark was reportedly later sold for 1.7 million rupees ($18,700 aprox). This is not the only time recently that a big sea creature has turned up in Karachi. Last year, a smaller (25 foot) dead whale drifted onto a local beach. It was also sold off, for over 100,000 rupees (over $2000). Although whale shark hunting is prohibited in many Southeast Asian nations, it does still occur. Sometimes they are even found mutilated with their fins cut off, as this article from 2010 documents. For more, you could also see our recent post on The Massive Scale Of The Shark Finning Trade. When you see a whale shark out of water like this, it makes you realize just how huge they are. It’s certainly a sad sight to see. Let’s hope we don’t see any more hauled out of the sea in the near future!